Home | Culture | opinion |Ancient Technology, As Intelligent As Modern Society? by Bri K5 Comments on Ancient Technology, As Intelligent As Modern Society? I was watching a program on the History 2 channel this morning, the big debate was the Ancients having more than simple tools (picks, axes, etc. )… Many historians do not believe that the Ancients could have things like a wheel type saw or the ability to create a lift of some kind… I am disputing that…. It is arrogant to think that the ancients didn’t have the intelligence, and to state that is just asinine. Common knowledge, ancient people invented the wheel, and how to use fire…. The Ancient Romans invented concrete that does not erode under water. Those are only a handful of inventions the Ancients came up with that we view as “modern technology”. Why is it impossible that they could have used solar, fire, steam, electricity, or wind power? Or even simple MAN POWER to make a machine work? If you ever look closely at any of the ancient buildings, you will see cut and drill marks. 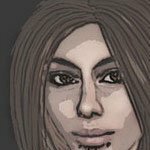 Take a trip over to this site and read their Stone Tech articles. They also have pictures where you can see the tool marks that are not the result of “simple” tools. When you look at the Ancient wonders of the world, the pyramids, the Roman Coliseum, Stonehenge… the list goes on… how you can dispute their intelligence or ingenuity? We still cannot figure out how they did all of that. 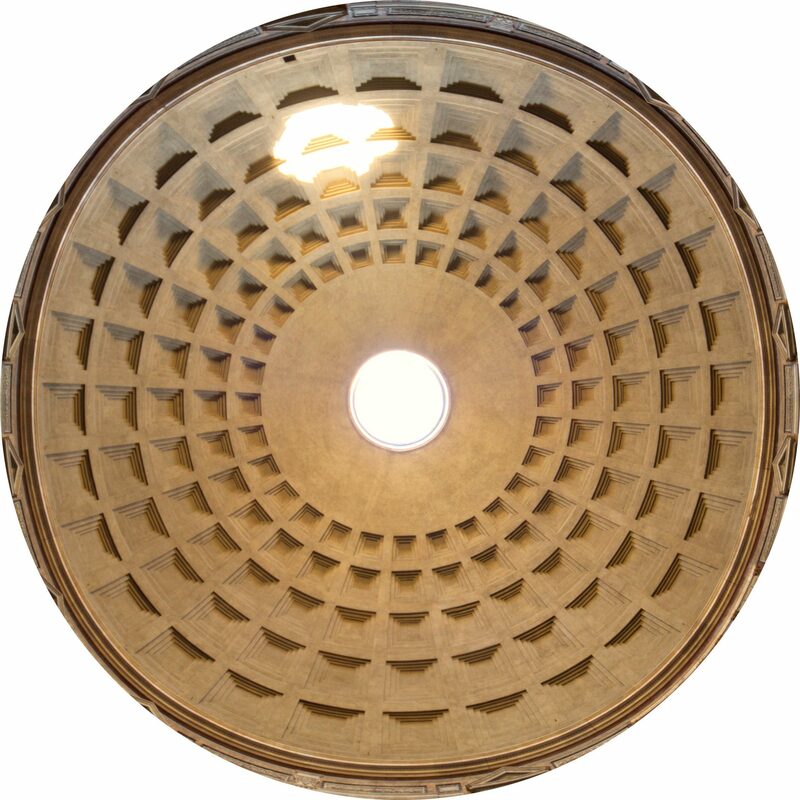 The Pantheon dome. The concrete for the coffered dome was poured in moulds, probably mounted on temporary scaffolding. The oculus is the main source of natural light. I would like to turn your attention to the Rotunda of the Pantheon in Rome. If this is not proof of Ancient technology and intelligence, I do not know what to tell you. 4,535 metric TONS of Roman concrete that has stood through wars, natural disasters, and common folk who would try to chip away the stone for their own homes since Hadrian had it built around 126 CE. 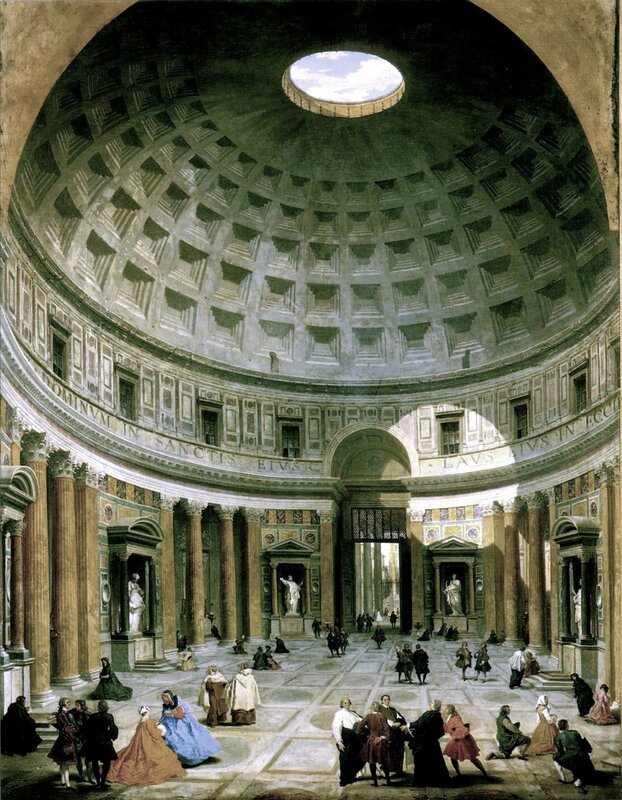 Pantheon Interior – Painted by Giovanni Paolo Panini. This work is in the public domain in the United States and those countries with a copyright term of life of the author plus 100 years or less. The fact that the architects knew that using a honeycomb system and adding the apex at the top of the “great pumpkin” would reduce the weight of the structure, to me, is proof of intelligence. They also did it without a computer telling them what to do… fancy that!! 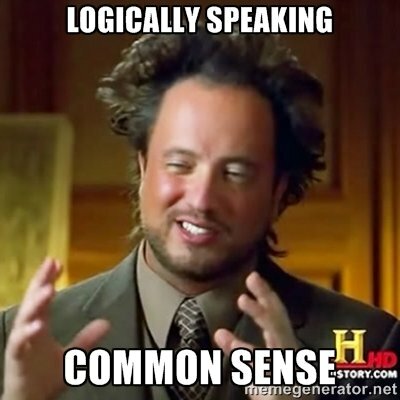 Common sense and logic… something the modern world needs a hell of a lot more of. If you can look at the magnitude of these buildings, knowing the tech they actually invented… How can you actually say they are less intelligent than we are today? I will leave you with this point…. if we are more intelligent than they were, especially with our technology and computers… how is it that they have built buildings that have lasted 2000 plus years, stood through floods and other major disasters, wars… And we can’t do the same… our buildings are lucky to last 10 years without needing to be condemned or redone. In my not so humble opinion, modern technology has made us “lazy and greedy”. We do not make something to last anymore, we make products that need to be replaced in X amount of time. We have cars that tell us when we have to get an oil change, books have become obsolete. Everything is within arm’s reach; you do not have to leave your house anymore! You can go to school online, work from home, have your groceries delivered to you. You can even pay all of your bills online. How many of us could survive on instinct if lost on a desert island or in the woods. Your cell phones don’t work, folks, you can’t call 911 or order a pizza… Could you survive? Another example is the Ulfberht, unique swords forged in Scandinavia by the Vikings using steel they brought back from the middle east. The swords were so special that they even inlayed the name ulfberht into the blade so false blades could be recognized. We didn’t get back to that quality of steel till the industrial period but its understandable when you think of their culture. Blacksmiths then held a high position and a warriors blades and tools were an extension of himself. So to go around with inferior items because it was cheaper to make or buy was unheard of. People also always point to the Mayans… OMGZ!!1!! Lookies at the walls! you cant fit a paper in there! HOW THEY MAKE? ALIENS!! Do I believe in extra-terrestrial life? Sure, its a big place out yonder, stands to reason something else is out there. Do I believe they come all these way across VAST stretches of time and space to teach use the finer points of carpentry and the best way to plan a building foundation…? The answer can only be… YES!! 😛 Some of those Mayan walls you can cut limbs off of your body if you aren’t careful. Let’s also look at the Stradivarius violins as another example. We still can not reproduce one with the technology of today, and no other violin in the world has that same tonal quality, before or since. Sure, speculation is the wood was at it’s coldest when he created them, but again, that’s only speculation. Especially since a recent study in PLOS ONE found no significant differences in median densities between modern and classical violins, or between classical violins from different origins. These results suggest that it is unlikely classical Cremonese makers had access to wood with significantly different wood density characteristics than that available to contemporaneous or modern makers. Thank you for adding to the conversation, I do enjoy the discussion you bring with your comments. Just to add, a man i vastly admire is Arthur C. Clark and he presented 3 laws to of prediction around technology and the future. And that is viable to Ancient Technology as well. Its easier to give the credit to some outside force helping them then to just admit you don’t know as much as everyone thinks you do.